Accommodation in Saldanha: Jane's Guest House. 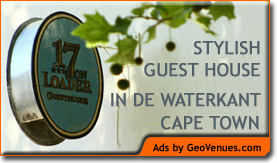 You are here: Home / Western Cape / Saldanha / Accommodation in Saldanha: Jane's Guest House. Welcome to Jane’s Guest House, Coffee Shoppe and Self Catering Accommodation in Saldanha on the beautiful West Coast of South Africa. Settle into the sublime 4 star luxury of Jane’s Guest House accommodation with magical sea views accross Saldanha Bay, savour the delicacies served on the patio or in the diningroom of Jane’s Coffee Shoppe while you watch the jet ski’s in the bay or if you prefer a self catering cottages, Jane’s Self Catering accommodation offers outstanding spacious self catering cottages and is fully accredited by the AA with a Superior commendation.